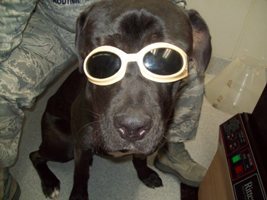 There are basically two types of laser therapy units: Continuous and Pulsed Lasers. Continuous Laser emissions act fast on inflammation, stimulating blood and lymphatic circulation, and inducing fast re-absorption of fluid build-ups; however, they only have a secondary effect on pain, which is diminished after reducing the inflammatory process. 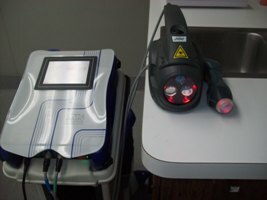 Pulsed Laser emissions, on the other hand, have an immediate effect on pain, since they are able to produce analgesia, interfering with the very transmission of the pain impulses to the higher brain centers, but they are less effective at treating inflammation and edema, only achieving results after a long period of application. Until now, no diode laser was able to induce strong anti-inflammatory, anti-edema, and analgesic effects simultaneously and within a short period of time. 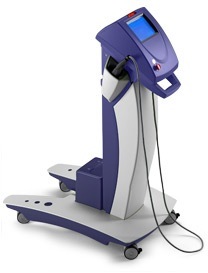 The MLS Therapy Laser was developed to overcome the limits of traditional Laser therapy. The MLS Therapy Laser is able to overcome the limits imposed by selecting one of the two emission types, since it is based on the characteristic therapeutic properties of a new Laser pulse. It uses an MLS pulse, which combines and synchronizes emission of continuous and pulsed Laser emissions with different infrared wavelengths. This patented control system synchronizes the two emissions and shortens the treatment period for treating pain, inflammation, and edema, and for repairing superficial lesions. 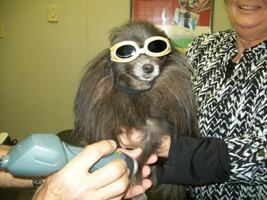 Conventional Laser therapy has been in use for more than 25 years. More than 3,000 scientific publications have been written validating its effectiveness. It has been demonstrated to be non-toxic and to have no side effects. 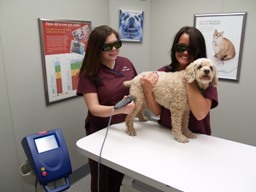 St. Charles Animal Hospital is very pleased to be the first hospital in the Maryland, D.C., and Virginia area to acquire the most advanced technology available today to leverage the benefits associated with laser therapy. What wavelengths are used in the MLS therapy? MLS therapy uses both the 808nm and 905nm wavelengths simultaneously. The 808nm wavelength is delivered using continuous emission while the 905nm wavelength is delivered using pulsed emission. Why are two wavelengths used? MLS Therapy uses two wavelengths to overcome the limits of traditional Laser Therapy. 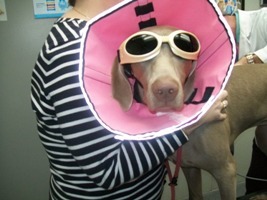 Traditional Laser therapy does not deliver both wave lengths in a reinforcing and synchronized fashion. Continuous laser emissions act fast on inflammation, stimulating blood and lymphatic circulation and inducing fast re-absorption of fluid build ups; however they only have a secondary effect on pain, which is diminished after reducing the inflammatory process. Pulsed laser emissions, on the other hand, have a practically immediate effect on pain, since they are able to induce analgesia, interfering with the very transmission of the pain impulse to the higher brain centers, but they are less effective at treating inflammation and edema. Is MLS Therapy approved by the FDA? Yes, the FDA has approved the use of MLS therapy and it is also patented via the US Patent Office. MLS Therapy is able to induce strong anti-inflammatory, anti-oedema, and analgesic effects simultaneously and within a short period of time. LLLT cannot achieve these results because of the limitations of using one or two wavelengths that are not synchronized. The patented control system that generates the MLS pulse synchronizes the emissions to achieve results previously unattainable. Thanks to this characteristic synchronization, the various therapeutic effects not only take place at the same time but reciprocally reinforce each other. What is the depth of penetration of the Harmony laser? The depth of penetration will vary based on the animal but it is safe to assume that it will penetrate 4-5 cm on most animals. How many treatments are usually needed to get results? Results can often been seen after the first treatment. Most conditions have protocols that range from 6-10 treatments. 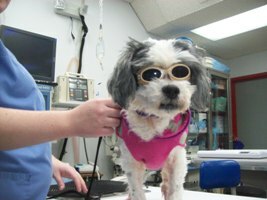 The treatments are cumulative and are delivered 2-3 times per week for 2-3 weeks. How was MLS Therapy developed and tested? MLS Therapy has been developed and tested following a strict course of biomedical and clinical research. The effectiveness of the combination of the emissions makingup the MLS pulse was initially tested in vitro on cellular cultures, then in vivo on animals, and finally by means of controlled clinical trials run by major state-of--the-art health organizations for treating traumatic and degenerative painful diseases.